Service on board was outstanding and food great. Very nice boat although smaller than other Viking longboats. Rooms are ample and comfortable with small balcony. 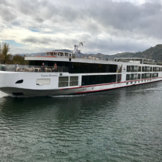 Portugal was not our first choice for the cruise - the Rhone cruise to the south of France was the first choice. However, because the Portugal cruise was the only one available in our desired time schedule we took it and boy, were we surpirized. It was a great cruise. Portugal was magnificent and our guides were exceptional as they were Portugese who are very proud of their country and did their utmost to show us the best that their country had to offer. They did a fantastic job. So, we got a great replacement for the Rhone which we will do at a later date. Porto, Lisbon and the Duoro Valley were definitely worth the visit. I am not a wine enthusiast but Port wines were great. We did the pre-cruise stay in Lisbon, but ended up being there too long, despite our hotel (Tivoli Avenida Liberdade) being centrally located and excellent. The ship is wonderful, although our cabin felt cramped. There is a large Lounge though, and a spacious upper deck with Pool. The scenery along the Douro (Duero) is wonderful. The staff on board look after you exceptionally well and you will always have plenty to eat and drink. Occasionally, we found the food to be bland and one day, our table of 8 all had tough, inedible steaks. Otherwise, the food was fine. Breakfast was disappointing, with packaged fruit juice (not squeezed), poor selection of fresh fruit and luke warm cooked breakfast. Eggs Benedict was fantastic, as were the freshly prepared eggs & omelettes. One major plus on this cruise, was that EVERYONE (about 100 guests is max) was warm, friendly and educated. Maybe a different class of people choose this type of cruise. We would highly recommend this cruise (Viking have 3 ships currently on this route). Beautiful cruise through scenic location. Be prepared for bus based excursions. Most excursion sites are some distance from the Douro River. Excursions were very interesting and informative. During our cruise there was little boat traffic. Brilliant views of vineyards and natural settings. Smooth sailing all the way. Crew was fantastic as you expect from Viking. Expect to be berthed between ships in Porto. Limits views from your cabin. When on the river views are impressive. The Osfrid is one of the smallest ships in the Viking fleet, but very well designed for this trip. Many in the crew were Portuguese, quite engaged and very committed to serving their guests on a very unique itinerary. Our only major disappointment was that the bed in our cabin had a notable and unfortunate peak in the center of the mattress which made a comfortable sleep more difficult than it should have been. One scallop as an entre'? Seriously? Food is NOT the highlight of this cruise. Great crew, great itinerary. One of the best cruise ventures in Europe. Air connections are tough at best. The true measure of a company's quality of service is determined not when things go right, but when they go terribly wrong. 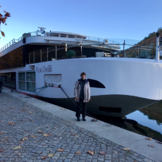 Viking River Cruises promises unconditional support when you join their trips, but offered none whatsoever when my mother in law fell inside the bus provided by Viking and broke her foot, ripped open her elbow, and painfully bruised most of her body. One can argue that she fell because she was not paying attention; others can make a stronger case that she fell because the step located on the longitudinal corridor inside the bus was not marked and was camouflaged by the black carpet. Putting aside blame for the fall, the only issue that prompted me to write this review relates to what Viking did (or better yet, didn't do) to help us after the fall; they did absolutely nothing. My mother in law and my wife joined me on a trip to Portugal 7 days ago for a Viking River Cruise in the Douro River. On day 1 of our trip, while touring Lisbon by bus, my mother in law fell inside the vehicle once it came to a full stop and it was time to exit for a short walk to Torre de Belém. It was quickly evident - by the bruising and the swelling - that she had broken something. Our local guides agreed, called a taxi, and told us about 2-3 nearby hospitals that we could use. And that was it: they called a taxi. From that point on we were on our own. 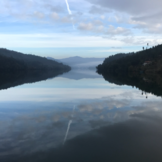 We had to navigate through the unfamiliar health care system in Portugal alone; we had to make multiple trips to the hospital and pharmacies without support; we had to deal with TAP Air Portugal and the required medical release forms without guidance. We spent 3 full days taking care of everything related to the accident without a single Viking representative being involved; without a single phone call from Viking; without a single offer from Viking to help us. We did not even get the Viking hotel rate for the additional night we had to stay at the Tivoli Hotel. In fact, while in the hospital waiting for my mother in law to be done with the medical care, we realized that we needed to call the local Viking staff to cancel the upcoming $300 dinner we had just joined the day before. We called Viking headquarters (the only number we had) and they could not find or provide a number for the Lisbon staff. A Viking representative took our number, and promised they would call back. Eventually, we gave up and managed to get the Viking local guide contact thanks to the wonderful Portuguese staff of the Tivoli Hotel. We are now safely back in the US and still no one from Viking has called us, even if just to find out how my mother in law is doing. The level of indifference, disregard, and disrespect displayed by Viking is truly heartbroken in any circumstances, but especially vicious when you realized they promised unconditional support and had no problem taking tens of thousands of nonrefundable dollars from us. It’s even more disgusting when you realize that they cater these trips to seniors citizens, some well into their 80s. For us, what was supposed to be a dream trip turned into a living nightmare. While Viking’s conduct was shameful and disgraceful, we managed to deal with the unfortunate accident in great part due to the incredible caring nature of the Portuguese People. The hospital staff at CUF Infante Santos was amazing and more professional than anything I’ve seen here in the US. Dr. Carolina went beyond her assigned duties to accommodate my requests related to the bureaucratic documents required for my mother in law’s transatlantic flight back to the USA; she did it without charging us anything. The staff at the Tivoli Hotel treated my mother in law with the love and respect she deserved. Felipe – one of the managers at Tivoli – offered me his personal contact for anything, and secured and provided a wheelchair for our entire stay with them at no additional cost. TAP Air Portugal upgraded my mother to Business class at a nominal cost, and took care of her as if she was their very own mother in law. In all this, the only entity that failed was the very one that advertised (and made us pay for) the opposite: Viking River Cruises. By the way, to this day we are still waiting for the phone call Viking promised to provide us with the Lisbon staff contact number. So, while Viking seems to be able to deliver a great service when things go well, they magically disappear when something goes wrong. The true “Buyer beware” business model; shameful! If you choose to follow Viking Osfrid you will receive weekly email updates with the latest reviews, tips, and photos from Cruiseline.com members about Viking Osfrid.